When coping with a diagnosis of FPIES, one of the primary considerations for families is often nutrition. Families may wonder what resources are available to them– either to help them navigate nutrition questions independently or with the help of a medical professional, such as a Registered Dietitian Nutritionist (RDN). We collected a variety of tools and support for navigating these questions that can be found here in the form of parent guides, fact sheets and multimedia online learning resources. 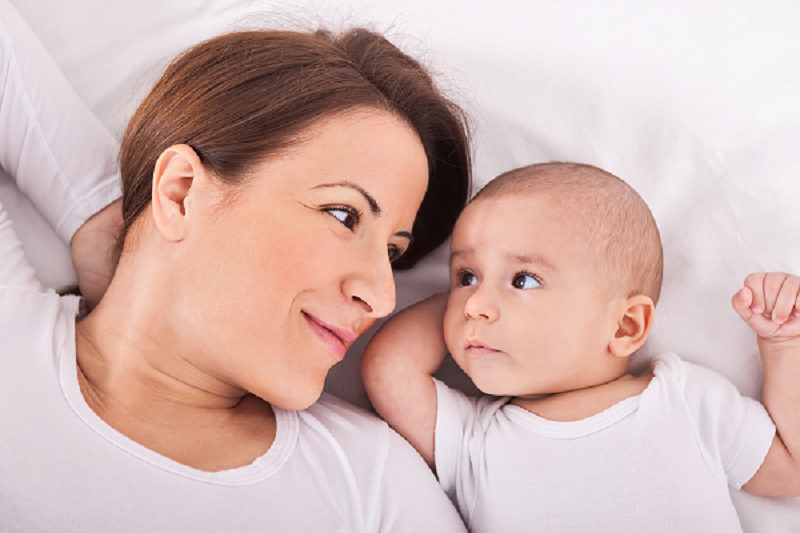 Who Can Help Me Understand the Nutritional Needs of My Child? Finding a nutrition professional to help you navigate the nutritional challenges that can occur with an FPIES diagnosis can help to give your family more peace of mind. Learning about the various credentials involved in a nutrition professional’s training is important to help you figure out which professional may be the best fit for your child’s treatment team. What is a Registered Dietitian Nutritionist (RD or RDN)? 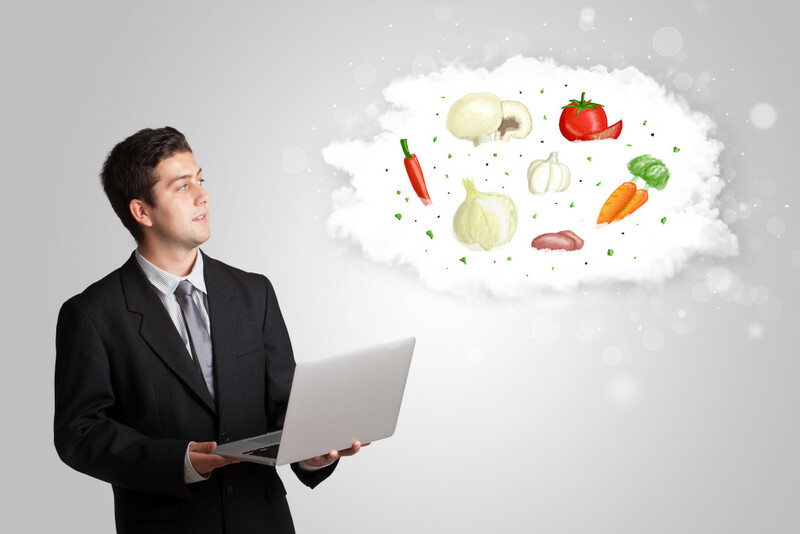 What is a Certified Nutritionist (CN)? What is a Registered Dietetic Technician (DTR)? A Certified Nutritionist (C.N.) is trained in nutrition through a two-year college level or distance learning six-course program, and has passed a proctored state exam. The title of simply “Nutritionist,” however, is a general term that does not by itself indicate a specific educational program or credential. A Registered Dietetic Technician (DTR) is trained in food and nutrition at the technical level of nutrition, has met credentialing requirements through a national exam, and maintains this registered credential through continuing education credits (CEU). In addition, to learning about the various nutrition professionals that you may be available in your area, you may also be interested in learning about resources and tools for managing FPIES in the kitchen. Did you miss our most recent Nutrition Webinar? You can still watch the recording and download the slides and worksheets, all free of charge! Please note– these nutrition and caloric calculators are designed to assess children without medical conditions. Children who are Failure to Thrive (FTT), on the high end of the growth chart (over the 85th percentile for height/ BMI), have had significant gain or loss of percentiles over time, or have other conditions that affect calorie needs (like Cystic Fibrosis) may have significantly different requirements. Protein needs are just as important for growth as calories. Working closely with your child’s team (including his/her Doctor and Dietitian) to provide a personalized nutrition plan that ensures proper growth is an important part of managing your child’s FPIES. Links provided here are intended for use as an additional resource to prepare you and your child for appointments and to provide additional support for the time between visits. Calculator for Daily Nutrient Recommendations An interactive tool from the USDA, this calculates daily nutrient recommendations for dietary planning, based on the Dietary Reference Intakes (DRI). Nutrition Data, a resource from the USDA. On Nutrition Data, you can locate detailed nutrition information and analysis tools about the foods you eat. Pediatric Calorie Calculator for estimating how many calories your child needs each day. This is best used under the guidance of a medical professional familiar with your child’s unique needs. Please note, growth charts are a tool used by your child’s medical team to measure growth over time. Every child has his or her own unique rate of growth. Although some healthy children can exhibit changes over time or outside of the typical range for their ages, children who fall outside the normal range should be evaluated– please consult your child’s medical team for interpretation of his/her growth. Included here are the most accepted growth charts (from the CDC and WHO); there are other charts available for use by a trained medical professional. Please visit with your child’s medical team to identify the most appropriate chart for monitoring and tracking your child’s growth. Breastfeeding a child with food allergies can be difficult, even if it is going well. There are solutions available to the majority of common breastfeeding problems. Reach out if you need help and check out the resources below! Children who have FPIES or allergy to both milk and soy may require a special formula that is partially or fully broken down into its basic components. If your child’s doctor has prescribed a medically necessary formula, you may be able to obtain insurance coverage. This varies by state, so check the laws in your area below. Some parents also get help through their local WIC office. Along with your child’s medical team, when you child is on a specialized formula, another resource is the Dietitians on hand to help with questions you may have about introducing formula, mixing instructions, dilution charts, recipes and other helpful tips when transitioning formulas (whether from one formula to another or from breast milk to formula) such as increasing the calories per ounce slowly. Always consult with your child’s medical team before making any changes to your child’s formula. Hydrolyzed dairy proteins with free amino acids, may be an option for children with FPIES. Amino acid based formula, may be an option for children with FPIES. Fund for Food and Families – application for additional financial help from CMNuA. Some children who are unable to take in enough calories or protein by mouth may require temporary or permanent placement of a feeding tube. Most children will continue to receive at least some of their nutrition by mouth, and even “permanent” g-tubes are removed once the child is able to meet his/ her nutritional needs by mouth. Although this can be a difficult decision to make, it can make an incredible difference in your child’s well-being. The Feeding Tube Awareness Foundation has a large number of resources available, including links to formula exchanges, information on insurance coverage and reimbursement, tips for traveling, manuals about feeding pumps, and information about tube feeding at daycare, schools and camp. Some children have enough safe foods that their parents can blend homemade formulas for feeding tube use. This can be a complicated process and requires medical guidance from a doctor and/or Registered Dietitian Nutritionist. AMT: Applied Medical Technology produces gastro enteric feeding tubes for adults and children. Discussing a care plan with your child’s medical team can be an essential step in the management of your child’s FPIES diagnosis. A care plan is made up of elements that help you and others that care for your child to know what steps to take in order to help prevent reactions and to manage any potential reactions that may occur. Emergency Action Plan for FPIES: Additional Emergency Room materials can be found here. Preparing for In-Office Food Challenges: Your child’s doctor may recommend an in-office food challenge to determine if your child will react to a certain food or if he/she has grown out of a known trigger. Many Parents have found it useful to keep careful notes on what their child is eating in order to identify possible triggers, and also to help their medical team assess whether their child is meeting their nutritional needs. 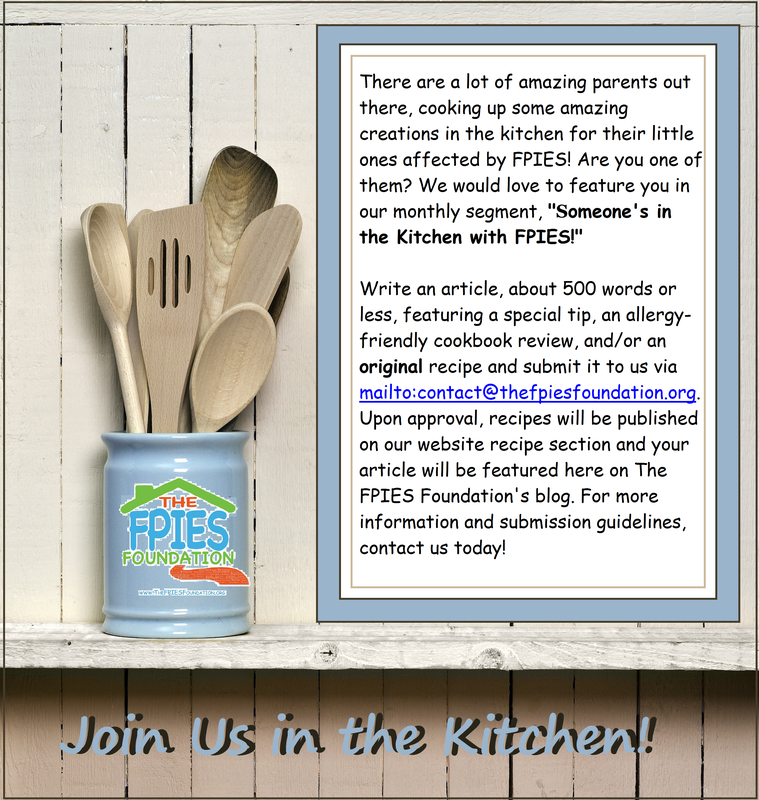 Parents of children diagnosed with FPIES may find that they need to be pretty creative in the kitchen, with meals and snacks! Though overwhelming at times, there are many tips and tricks for substituting ingredients and making foods more appealing. “Someone’s in the Kitchen with FPIES:” A New Blog Series on The FPIES Foundation blog! Some children develop aversions to certain foods or textures, or may even begin to refuse all foods. There are many things to do to avoid or treat this aversion. Some children also need therapy to treat a swallowing problem. Ask your child’s doctor whether you need a referral to a feeding team to help you. These teams often have occupational therapists, speech therapists, and registered dietitians. Feeding Matters Resource Directory – comprehensive information and helpful resources to deal with feeding struggles. Children’s Medical Nutrition Alliance – resources for medical food access. Herbal Nutrition from Natural Medicines Comprehensive Database.